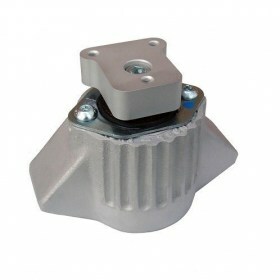 This RH rear mounting carries a proportion of the powertrain weight and reacts fore-aft and lateral forces. By combining stiffness fore-aft and laterally with some compliance vertically we are able to reduce the engine movement and still retain noise and vibration isolation. It also gives vastly superior comfort and isolation from engine vibration over inferior aftermarket urethane mounts.